Stems slender, erect or ascending, leafy and usually branched, 5 to 25 inches high, from a perennial root, propagating by slender stolons. Leaves ovate-oblong or ovate-lanceolate, thin, pointed at the apex, rounded or slightly heart-shaped at the base, coarsely toothed, 1 to 3 inches long, on slender petioles, the upper leaves smaller. 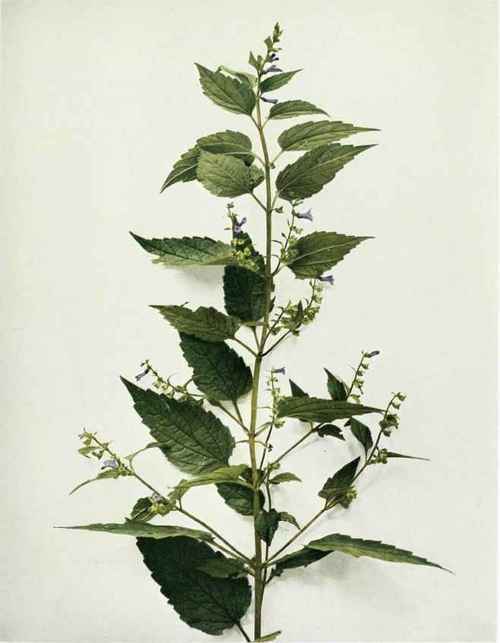 Flowers blue, several in axillary and also terminal one-sided racemes, one-fourth to nearly one-half of an inch long, sometimes nearly white; the lips of the corolla about equal, the tipper lip arched. Calyx two-lipped, the lips entire, the upper one with a crest or protuberance upon its back. In wet meadows and marshes, Newfoundland to British Columbia, south to Florida, New Mexico and Oregon. Flowering from July to September.